The portal www.zagorodna.com suburban real estate consulting company RealEkspo "continues to summarize the results of an independent professional rating of-competition. Auditor rating - consulting company RealEkspo. To participate in the Ukrainian professional ranking developers or owners built or being built cottage townships must fill out the form on the site, adding the total picture, the general plan of the town, the layout of houses, which should be sent to the email address admin@zagorodna.com After proper validation of experts will take your town participate in the rating. Estimation is automatically in real time. Cottage villages assessed on key parameters: location (2 to 5 points); property type (2-5 points), availability (3-5 points); area of cottages (2 to 5 points); land area (from 2 to 5 points); architecture (1-5 points), environment, safety and security (2-3 points), comfortable accommodation (2 points), communication (2-3 points), the material of walls, roof (2-3 points ). Each object infrastructure is estimated at 1 point to the availability of infrastructure facilities on the master plan, which is mandatory for participation in the ranking. According to the results of calculations every town gets the total score, which determines rank. Data to estimate the parameters and factors there is evidence from builders from primary sources, Internet, media and our own research experts suburban real estate market. According to the portal www.zagorodna.com, the rating was attended by 15 developers and builders of cottage townships, Kiev region, completing the application. Among the participants: under construction, and built towns. By Region: 3 town located in the Obukhov district, 4 of the town - in Kiev Svyatoshinsky, 2-in Vyshgorodsky, 3-in Kyiv, Vasilkovskaya Boryspil and Makarov, one by one. By distance from the city: 7 campuses are located at a distance of 10 km and 8 camps from 10 to 20 km ..
With all the towns have a good message for bigger, not near industrial areas. Cottage villages are located at a distance of 1 to 3 km of roads, some near-roads. Social environment for all homogeneous, since all residents have equal status. All towns runs urban transport, and some - taxi to the village. Active in the ranking of towns being built area of 5 to 150 hectares. By the number of households is small towns where there are up to 50 homes, but there are those in which, from 200 to 400 homes. Area of houses in the villages ranged from 150 to 400 sq.m. Floors: high-rise buildings, from 1 to 3 floors. The area of land near the home ranges of townships from 5 to 50 hectare. Cost of 1 sq. m in rating participants will start with $ 500, and finish up to 3000 dollars. Almost all villages have forest, river or lake. With regard to security, all towns have guards, CPT. Each object infrastructure estimated 1 point. Number of infrastructure in each village is different, so scores are different. Seriously affect the evaluation of the town wall material, from which he could build houses. In 13 villages of 15 houses built of brick. As for interior, then some of it is laid down in price. Material rooftops in towns: tiles, metal and soft roof. In 10 out of 15 towns have landscaping. Telecommunications in the cottage towns are telephone, Internet, alarm system. In all the towns has its own service manual. Engineering infrastructure is presented very well and score well on the availability of communications. According to the results of the second half of 2010, the number of championship points became an elite cottage community "Maetok.Zhemchuzhina Italy" (137 points). Second largest number of points in an elite cottage village "Gold Zatoka" (136 points). Third place in the ranking has taken cottage "Sun Valley" (130 points). "All results of the rating by the robot path through the assessment assigned to each indicator, the builder-developer-filled forms, available on the website Zagorodna.com. The great interest of developers to the rating and its results. This is reflected in the number of new companies in the ranking as compared to October. 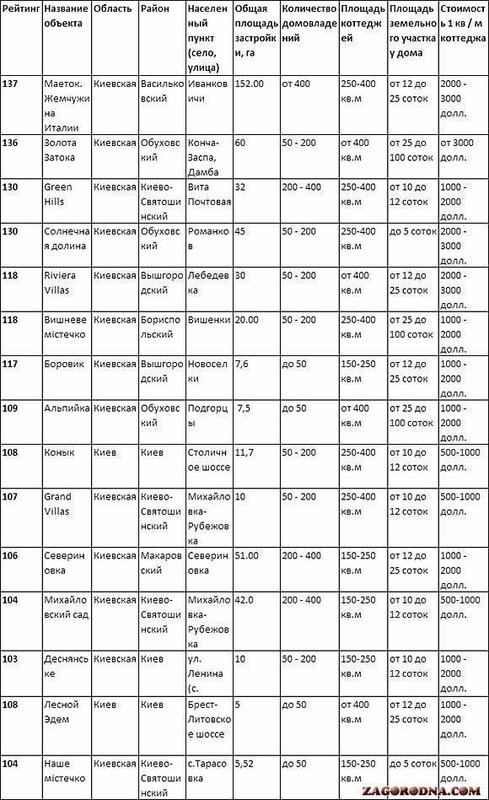 It should be noted that the campuses, located in Kiev, the amount of points differs from the villages located in the Kiev region. The difference is different on infrastructure. In Kiev facilities infrastructure is not necessary, since towns are located within walking distance from the city's infrastructure: schools, pharmacies, shops, restaurants, cinemas, etc. " Top 10 best cottage towns refer to the main portal page. © Protected by the Law on Copyright. " Reprints allowed with an active link to the source. "